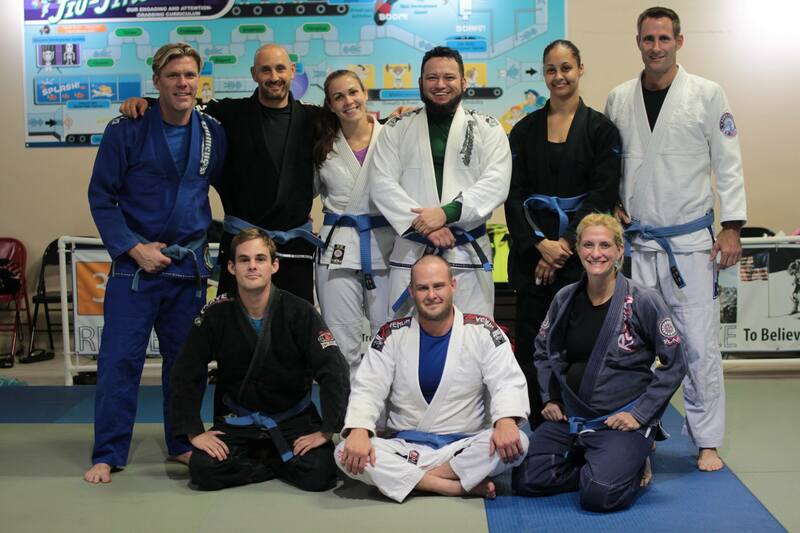 Just a week after competing in the Miami International Open, Team Third Law decided to send a handful of competitors to North Florida to compete in a NAGA in Jacksonville. They piled into a minivan for the five-and-a-half-hour-long road trip, and after a good day’s work at the tournament they had three championship belts, three gold medals and six silver medals to show for it. Andy, who is just 13 years old and recently received his green belt, tore up the teens expert divisions, going 5-0 for the day. He won his first no gi teens expert division match by mounted triangle for gold, earning a championship belt, and also won gold in his gi teens expert division, defeating his opponent 11-0. Looking for more matches, Andy moved up into older age-group brackets. He won an extra no gi expert division match 14-0 for another gold medal, and then defeated two blue belts 11-0 and 16-0 in an extra gi teens expert division for yet another gold. Coach Katy won gold in her gi division, earning a championship belt. She submitted her first opponent with an arm triangle and then defeated the second on points. She also won one match in her no gi expert division for silver, outscoring her opponent 6-0 before the other girl was disqualified for stalling. Coach Joe submitted his opponent with a bow an arrow choke for gold in his gi division, also earning a championship belt. He also won one match by rear naked choke for silver in his no gi expert division. Theresa, who just received her blue belt a few days before, won her first blue belt match 7-0, taking home a silver medal in that division. She also won one match in her no gi intermediate division for another silver medal. Coach Joey submitted his first opponent by triangle in his no gi expert division, taking home silver, and also took silver in his gi division, winning one match 19-0. Thanks to Angel and Mabel, Andy’s parents, for taking on the road trip with the team and cheering on all the competitors. On to the next one!